I went to hear Paul Feldwick speak the other night. Apart from being a top ad man, he's also a committed poet and lover of poetry. He was thinking about the connections between the two and started to think about praise (Odes and Praise Songs). He read Ode To My Socks brilliantly and made me realise exactly what I want to do with In Defence Of The Ordinary. 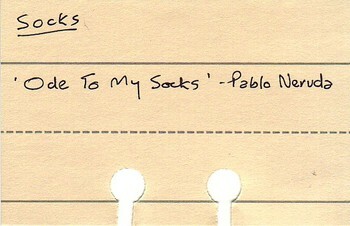 His thought about Neruda's poem was that in going so over-the-top in praise of something as ordinary as his socks he actually came out the other side of funny and ended up being quite serious and profound. I'd love to do that. I can do the hyperbolic examination of the apparently banal, the question is, can I come out the other side? Now that's a proper challenge.